Here’s to another weekend! We’ve got amazing things happening from Taste of Atlanta to Owl-o-ween! Get the lowdown all the great events going on the next few days! Historic Oakland Cemetery receives many visitors each day, but only at Halloween do the gates stay open after dark. Witness the magnificent final resting place of Atlanta’s sons and daughters during the Capturing the Spirit of Oakland 2014 Halloween Tours. There are tours both Friday 10/24 and Saturday 10/25. The Hackensaw Boys are a string band formed in 1999 and based in central Virginia. The band has drawn on many musical influences and are “known best for rowdy, energetic live shows.” Over the last fifteen years, the band’s live performances have earned a measure of notoriety in the Mid-Atlantic region. They have performed at U.S. festivals including Berkeley Springs River Days Festival in Berkeley Springs, West Virginia and the Spring Pickin’ Bluegrass Fest in Blain, Pennsylvania. To kick off the city’s most anticipated food festival, Taste of Atlanta is serving up a fusion of incredible food and rockin’ music – block party style! On Friday, October 24 from 7:30 – 10:30 p.m. in Midtown at Tech Square, food lovers and music fans can join with Chefs Ron Eyester, Ford Fry, Jay Swift, Suzanne Vizethann and other local celebrity chefs as they serve up their specialties. The seed for this album was planted during a one-off show back in 2012. Bazan was invited to play a show in Tacoma WA with the Passenger String Quartet. PSQ leader Andrew Joslyn put together string arrangements for 4 songs and it was an enjoyable evening for all. They immediately began talking about doing it again and eventually started talking about making proper studio recordings of these songs. But it took nearly two years for everyone’s schedules to line up again. A four-piece alt-rock outfit based in Brooklyn, American Authors use their razor-sharp musicianship and natural mastery of songcraft as a jumping-off point for sonic exploration. On their debut album Oh, What a Life, singer Zac Barnett, guitarist James Adam Shelley, bassist Dave Rublin, and drummer Matt Sanchez weave in everything from hip-hop grooves and Afro-Latin rhythms to dance-pop synths and Queen-inspired vocal harmonies—all while staying true to a rock-and-roll energy and melodic sensibility that’s highly refined. 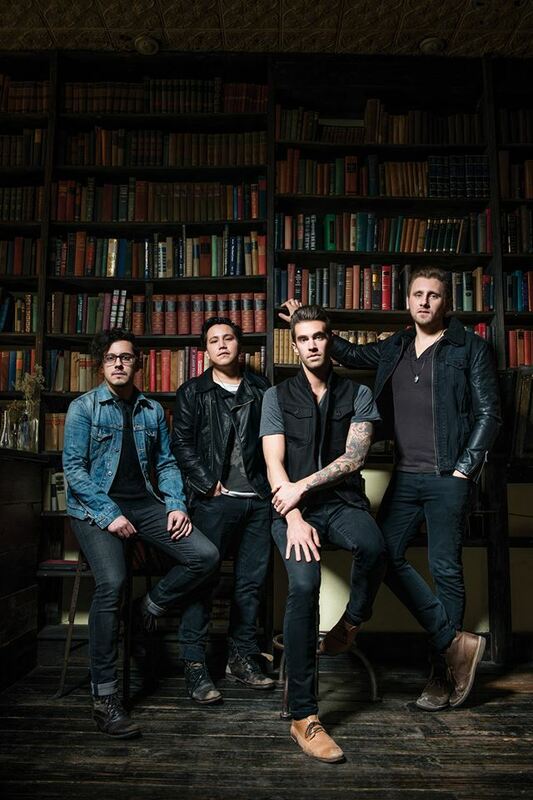 Featuring their breakout hit song “Best Day of My Life” and follow-up single “Believer”,” the sunny yet soulful Oh, What a Life is also built on a magnetic sense of optimism that’s carried American Authors from their formation at Boston’s Berklee College of Music to their down-and-out early years in Brooklyn to their current status as an internationally touring band on an ever-growing rise. In the ever-changing landscape of modern pop, Nathan Angelo shines as a refreshing alternative, embracing the classic elements of popular music and celebrating the backbeat of American tradition. As the revival of music in the 60’s and 70’s brought together the heritage of the Great American songbook, the flair of jazz and heartache of the Delta blues, Angelo integrates these forms into his own music with great ease and delight. Smithsonian is a band composed of five veterans of the Atlanta music scene who have united in their affection for the short but sweet career of The Smiths. Bret Busch (Pardner, The Hots) on vocals, David Chase (Dropsonic) on bass, Brian Fletcher (Luigi, Magnapop, Marcy) on drums, and Jim Prible (Opal Foxx Quartet, Poodles, Seersucker) and Lindell Todd (Pineal Ventana, Victory Girls, Silver Lakes) on guitars are making their way through the entire Smiths catalogue. The Blacksburg Partnership presents the 6th annual Blacksburg Brew Do, a craft beer festival, on Saturday, October 25, 2014 from noon-6pm at the First & Main Shopping District. Over 100 different beers from around 40 local, Mid-Atlantic, and national craft- and micro-breweries will be poured. Attendees will savor culinary delights from local restaurants and enjoy home brewing demonstrations, live music, tailgating fun, and the culmination of the 6th annual Brew Do Homebrew Competition. During her freshman year, K.Flay and a friend were discussing modern rap music. Believing that most hip-hop hits on the radio were simplistic, misogynistic, and formulaic, she proclaimed that even she could do a song like that. To demonstrate, K.Flay spent that night writing a song calledBlingity Blang Blang, which she described as “a low-budget rap parody that contained far too many obscenities.” Realizing that she actually enjoyed it, she wrote two more songs before the end of the year. The summer after her freshman year at Stanford was a period of experimentation. She continued to write more songs and discovered how to record them as musical tracks on her laptop computer. During her sophomore year, she began performing for live audiences, and in her junior year she released her debut album, Suburban Rap Queen, which has earned her quite a local buzz and myriad fans, thanks in part to her internet web page and MySpace profile. After ten years on the road, hundreds of shows and shelves of song-filled notebooks, Andy Zipf is taking a new name: The Cowards Choir. “In 2009 I released The Cowards Choir EP. It was the first time I remember feeling like I’d found my voice,” said Zipf. Two years later Zipf’s voice strengthened and expanded. The “Jealous Hands” LP showcased this seasoned range and clearer vision. “As far as I’m concerned, Jealous Hands is my first record. My friend and producer Jeremy Griffith figured out how to capture the sound I’d been hearing my head all this time.” He called it a “new direction”, turning down a bit of the aggression, tightening up melodies and honing his true to life lyrics. As Tedo Stone, they released their first 6-song demo Happy in August 2012 (via This Is American Music) with Athens, GAs John Keane (who has recorded the likes of R.E.M., Uncle Tupelo, and Widespread Panic and who also played pedal steel for them). With an under-streaming of pedal steel guitar, Happy explores the territory where psychedelic southern rock-and-roll and soul meet. The EP opens up with perhaps Stones most poetic of the lot, Cold Floor, on which he sings poignant paradoxes like, half alive, half dead. Its always gone. Its always there. Sometimes. All of the time. Eliot Bronson is the type of songwriter who could squeeze out something meaningful about taking out the trash. He writes heartfelt songs with dark humor and backs them with his resonant voice and swampy instruments. Back in his hometown of Baltimore, he was dubbed a folk-singing wunderkind. He then moved to Atlanta and started the Brilliant Inventions with Josh Lamkin. The duo quickly won the Best New Local Music Act in the 2008 Creative Loafing Readers Poll. MERCHANDISE is a band fighting against the easy categorization reserved for abbreviated biographies. The project is equal parts punk misanthropy, maudlin balladeering, fine art, low humor, classical study, psychedelic spacecasing, mad science and pop genius. The Legendary Bill Cosby is an American comedian, actor, author, television producer, educator, musician and activist. A veteran stand-up performer, and is well known for his many comedic performances and television roles including The Cosby Show. He has won numerous awards including People’s Choice Awards, Grammys, Emmys and more. Shows are at 3pm and 7pm. REWIND, PLAYBACK is available In Stores Fall 2014. Rewind, Playback is a seat on the bus with a band of friends. On a ride that spans two decades it explores the power of friendship and the endurance of love, the cost of commercial success and what happens when we have a chance to look down the road we did not take. Secret Chiefs 3 have switched in to high gear. Having just completed a national tour in October with legendary Italian Giallo Horror soundtrack masters, Goblin, they released their long-awaited “Book of Souls: Folio A” album in late November. Next they are touring the west coast in February in support of that new album, and, surprise of surprises, are doing so armed with TWO new 7” records in hand. These will be available in stores stocking through Revolver USA, but those attending shows on the band’s February tour can get them right away.